As summer slowly winds down, it is a good time to plan and create a quiet spot in your yard to sit and relax from a hectic day or week. The upcoming cooler weather will make an evening in your garden both peaceful and refreshing. I have flowering plants and shrubs in my landscape as well as hanging baskets hanging from long chains from our Oak Trees. I have plants which bloom for several days to weeks that attract butterflies and bees. Pentas, Salvias, Lantana, Porter Weed are wonderful nectar plants for the bees and butterflies. Milkweed, Fennel, Cassia and Passion Vines are host plants for butterfly caterpillars. I consider these plants to be my daytime standouts. Some people do not know that you may have nighttime standouts as well. 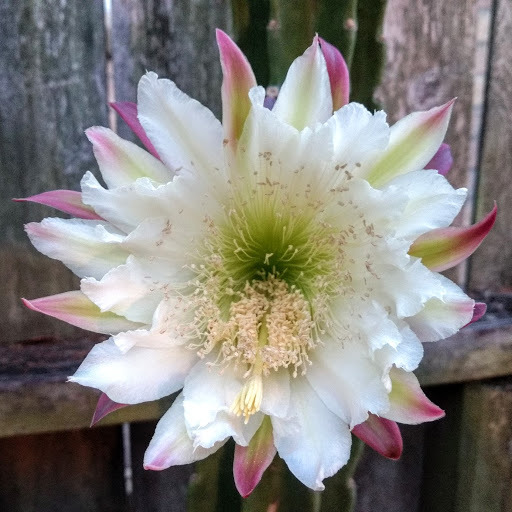 I have two upright Night Blooming Cereus. They are slightly different varieties which open about 10:30 at night with quite a spectacular display. The large bud, about 3 to 4 inches will pop open in about 5 to 10 seconds. It will only last for the night and will start closing just after sunrise. 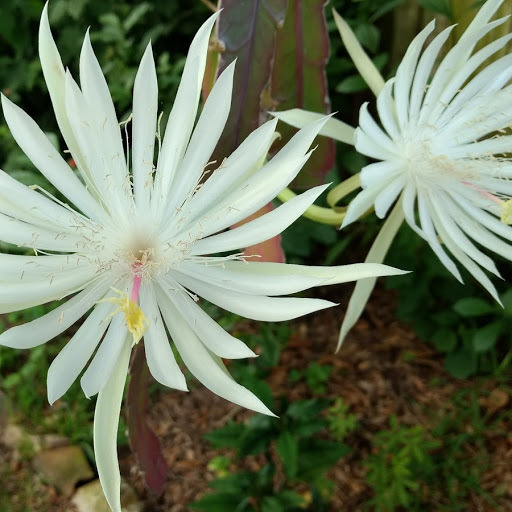 I also have a night blooming Epiphyllum Cactus which is in the Orchid family. It will also pop open around 10:30 and produce a very fragrant bloom until sunrise. I usually have to catch them in early morning before sunrise. What a great way to start the day.But I must admit, my most favorite night bloomer, is my Night Blooming Jasmine. Tiny white tubular flowers will burst open with fragrance once the sun sets. Not at dusk, but once darkness envelopes the yard, the Jasmine flowers shoot fragrance out like a bellows creating a heady cloaking fragrance. It is really quite spectacular. What a great way to end the day. So pull up a chair and enjoy your garden. Cooler weather makes morning, afternoon and evening all equally enjoyable. A bird, bee and butterfly friendly environment will be a joy to all who take the time to sit and enjoy the view.